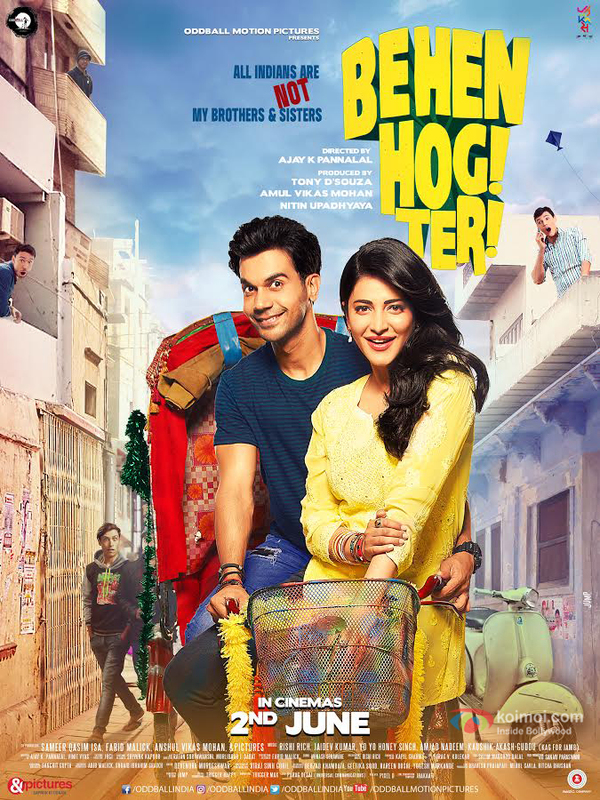 Behen Hogi Teri’s New Poster | Rajkummar & Shruti’s Romance Is The Talk Of The Town! Usually, films these days launch their content in a set pattern that has been tried and tested and as a matter of fact, been overused. Amul Vikas Mohan is making sure that Behen Hogi Teri starring Rajkummar Rao and Shruti Haasan is bending the rules and leaving their own trail by launching their quirky, fun content which is their song, trailer and now their poster as and when they think it’s the right time for it. The new poster features Rajkummar and Shruti on a bicycle while their neighbors are seen staring at them with suspicious expressions. Unlike fellow industry mates, Behen Hogi Teri has taken it on them to launch the correct content at a time that caters best in its favor. First they came out with their ‘Jai Maa’ song during Navratri because it seemed like the perfect timing for it and then they came out with their trailer which audiences and critics have been raving about. It has garnered massive appreciation and views from fans all over. Now, team Behen Hogi Teri is launching their poster which they hope will also get just as much love as the other material of the film did. Oddball Motion Pictures present Behen Hogi Teri is produced by Antony D’souza, Amul Vikas Mohan and Nitin Upadhyaya, directed by Ajay K Pannalal. The movie starring Rajkummar Rao, Shruti Haasan, Gautam Gulati, Gulshan Grover, Ranjeet and others releases worldwide on June 2nd, 2017. Rajkummar Rao was last seen in Trapped, where he played a man who is trapped in his own house at a high-rise building with no escape. Produced by Phantom Films and directed by Vikramaditya Motwane, it released on March 17. While on the other hand, the fillm’s lead actress Shruti Haasan’s last film was Katamarayudu opposite Pawan Kalyan, which did great business at the box office. The post Behen Hogi Teri’s New Poster | Rajkummar & Shruti’s Romance Is The Talk Of The Town! appeared first on Koimoi.